It’s been a while since I did a Tuesday flashback kitchen design – only because I had so many other posts lined up. But I’m reviving them, because they are so much fun. If you have the space, built-in pantries are ideal. Notice how the soffit extends to enclose them. And how the pantries themselves create an enclosure of sorts for the washer and dryer. Fitted=50s. On the orange accent color: With such a dynamic cabinet color, the accent has to be strong, too, or it will disappear. I love this light fixture – very very modern, like the chairs and lamp. 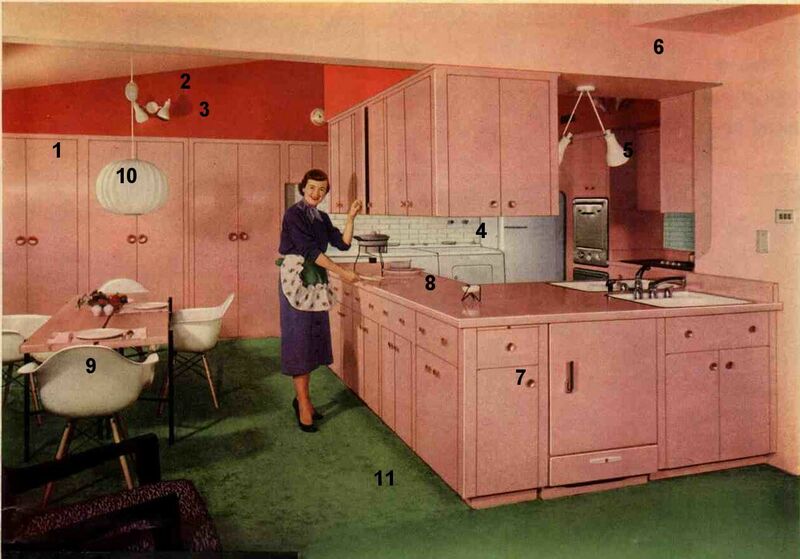 The “appliance white” repeats in the chairs, the lamp, the tile, and the appliances. I haven’t seen a lot of photos from this period featuring subway tile (vs. 4″x4″ tile). Here, the horizontality (word?) of the subway tiles contrast nicely with the verticality of the pantries. Also in this space, see the washer and dryer. 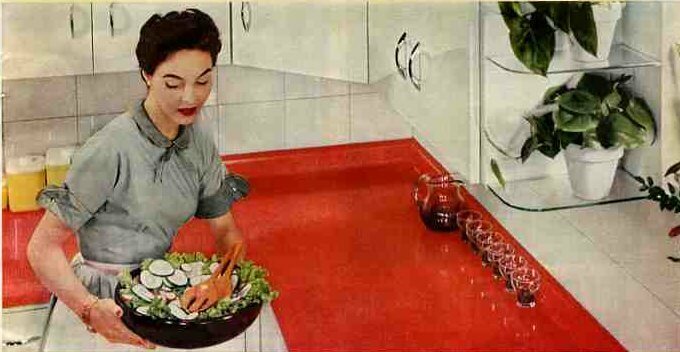 There certainly was a move to convince women to do their laundry in the kitchen …. it didn’t work. Finally, this whole block of appliances is treated as one working “white space” and is a part of what keeps your eye moving around the kitchen. Notice the second light above the two sinks, same idea as the one above the pantries. The designer used the soffits throughout the room as a design element. This can be very important in kitchens. I’ll do more on soffits sometime soon. Notice the cabinet pulls. Is there a word for this style? They are awesome. Monotone countertops. Considering the strong orange and green accents, it works. Shell chairs are cool. Get authentic repro’s from modernica.net. George Nelson bubble lamp. Also from modernica. Green carpet – exact opposite of orange, on the color wheel. In fact, when you put together the pink, orange, green and white blocks, this kitchen takes on a Mondrian-esque color block feel. One more interesting note. 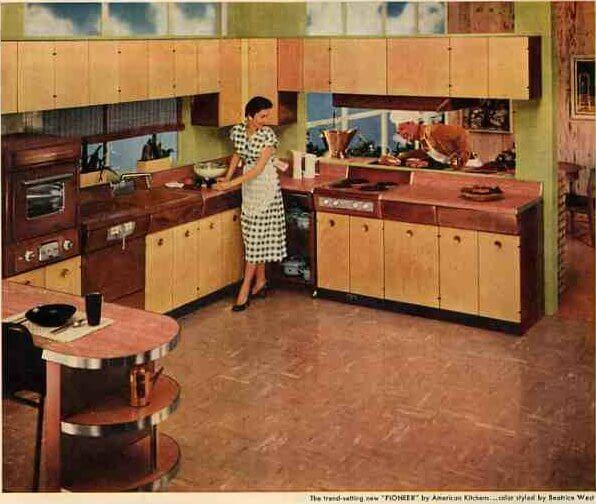 As the 50s progressed, we really saw kitchens opening up to the other spaces, rather than remaining a separate room. 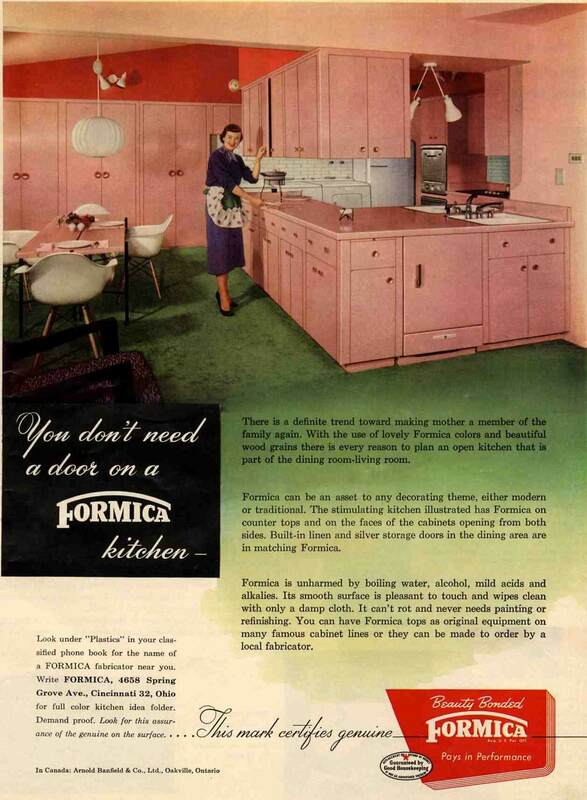 “…a definite trend toward making Mother a member of the family again,” as the Formic ad says. 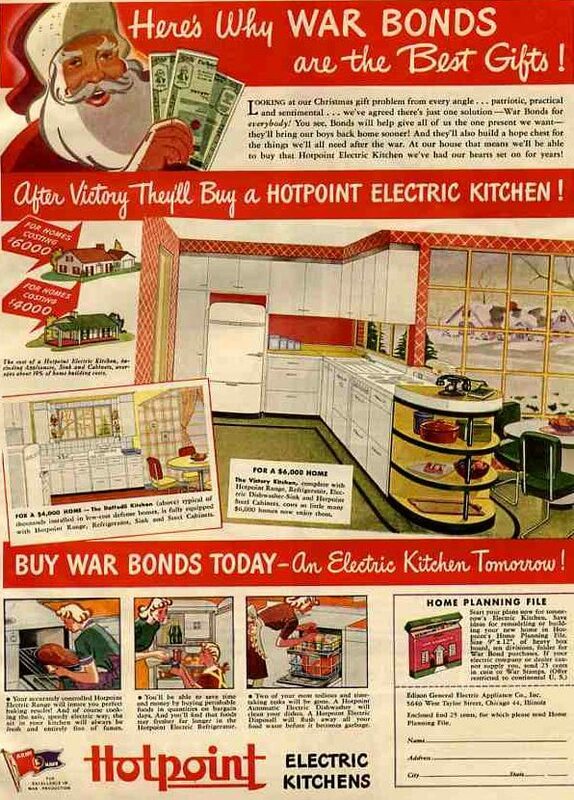 Of course, the open concept kitchen is a trend that continues strong to this day. And mom not only made it back into the family, she is in the Board room, too! Eeew, dirty laundry in the kitchen! What is the countertop edging, wood ya think? I don’t think that’s subway tile – I think it’s brick. 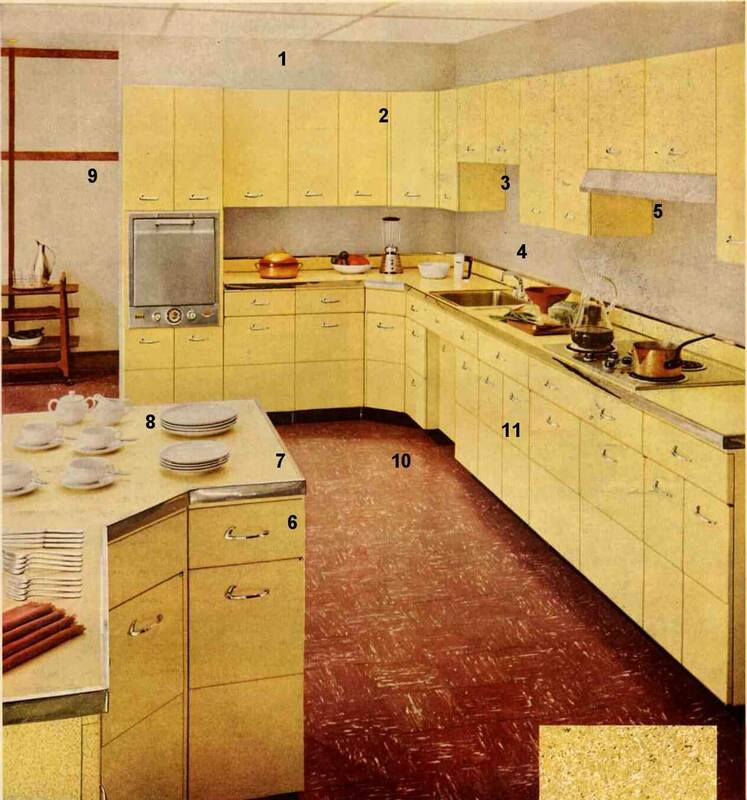 Reminds me of my Gram’s kitchen and she had brick – actual white brick, not painted – behind the stove and on one wall that looked just like this.